A hearing evaluation is the first step in determining your hearing capability. If you have a hearing loss, it will detail the extent, type, and specifics of your particular hearing loss. The hearing evaluation will be performed by a hearing instrument specialist usually in his or her office, using equipment called an audiometer. The hearing evaluation consists of a variety of tests to determine the unique aspects of your hearing loss, as well as the level at which you can detect and understand speech. Hearing evaluations identify hearing loss, and give your hearing instrument specialist important information to help determine the best course of action for treatment. Some types of hearing loss can be treated medically or surgically, so it's important that these types of hearing losses be ruled out before hearing aids or other treatments are considered. 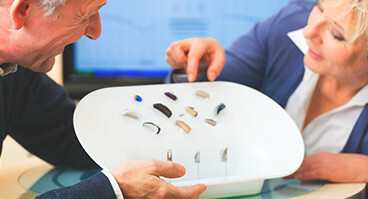 If it is determined that you could benefit from hearing aids, the hearing evaluation helps your specialist know which hearing aids will be most appropriate for your needs. What Can I Expect During a Hearing Evaluation? The evaluation will probably last about 30 to 40 minutes in length. You should also allow for time for discussion with the specialist to review test results, and ask questions. It is recommended that you bring a family member with you to the evaluation appointment. Most specialist’s agree that hearing loss is a family issue. It helps to have another supportive person at the appointment to help you understand the information and recommendations. Before your appointment, a case history will be completed and the specialist will want to hear about any complaints you have about your hearing. He or she will pay special attention to any concerns you have about exposure to noise, tinnitus, and balance problems. Make sure that you take a full list of any medications and supplements you are taking with you to your appointment. The hearing evaluation is a good chance to establish a relationship with your specialist. It helps to ask around for recommendations to specialists in your area and find someone who listens carefully to your concerns. Above all, don't be afraid to ask questions. You will want to be clear on any information you receive so that you can be an active participant in finding hearing solutions that work best for you and your lifestyle.